The United States Army adopted the Colt Model 1911 semi-automatic pistol which was in .45 ACP. There were various versions made and over 100 years later, some are still in service and new versions are being made. A rare complete and documented set is in the New Westminster Museum and Archives, New Westminster, BC. That pistol is serial number C13085. There are Canadian C/|\ (arrow inside the “C”) signifying that it was Canadian issue. 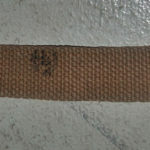 It has wartime issue markings on the front of the grip. This particular set was issued to an officer from New Westminster. His name was Courbold as I recall. 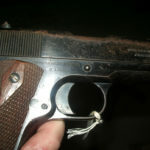 The 1914 dated MILLS webbing was very little used by him, but there is also a different very well worn holster that appears to be the one that he wore in action to carry this pistol. I photographed it in 2006 as I found it. The firearms had been hidden away by my predecessor who did not like historic firearms and they were all allowed to become rusty by neglect. I cleaned the firearms and applied oil, but sadly the damage was done to the finish. Colt 1911 Commercial pistol, one of 5,000 purchased by Canada in 1914, serial number C13085. Magazine for Colt 1911 Commercial pistol, one of 5,000 purchased by Canada in 1914, serial number C13085. 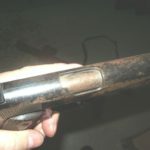 Note the loop on the bottom of the magazine so that it could be tethered to prevent loss. 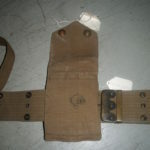 Inside the waist belt for Colt 1911 Commercial pistol, one of 5,000 purchased by Canada in 1914, serial number C13085. The WWI owner’s initials “BC” was show and the Canadian issue mark C/|. 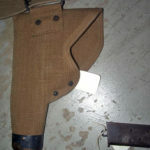 Back view of the MILLS 1914 holster Colt 1911 Commercial pistol, one of 5,000 purchased by Canada in 1914, serial number C13085. Inside the flap of the MILLS 1914 holster Colt 1911 Commercial pistol, one of 5,000 purchased by Canada in 1914, serial number C13085. Shows the MILLS (inside a cartridge) and C/| ink stamps. 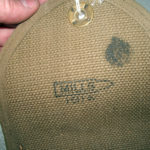 The MILLS 1914 magazine pouch with two magazines for Colt 1911 Commercial pistol, one of 5,000 purchased by Canada in 1914, serial number C13085. 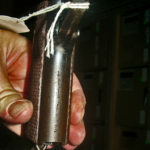 Shows the MILLS (inside a cartridge) . On the magazine on the right, the staple has broken off. 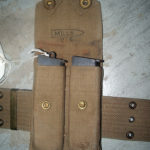 MILLS 1914 shoulder strap with Canadian markings for the Colt 1911 Commercial pistol, one of 5,000 purchased by Canada in 1914, serial number C13085. Good news for Colt collectors. One can write to Colt to obtain a Colt Archive Letter which tells you where the Colt firearm was shipped to from the factory. The cost is about $100 U.S. The Canadian 1914 purchase of 5,000 pistols were NOT in solid blocks of numbers and the Colt Archive Letter is usually the only way to verify the Canadian issue. 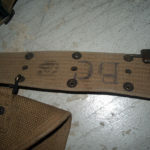 The Canadian issued magazines were stamped the the C/|\ (arrow inside the C) Canadian issue mark, on the bottom, forward of the loop. The pistols however were not issue marked. Officers were expected to buy their own handgun. A nice benefit of this is that some chose to have their name engraved on the slide. Such named pistols are more valuable as the man’s service history can be researched. 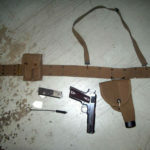 How you navigated to this page: www.captainstevens.com > Military & Police > Weapons > Colt .45 ACP Model 1911 etc.